The original deal since 1996. We play….YOU sing! Pick a song, we give you the lyrics. We call your name and voila! you are the singer in a punk rock band backed by the finest hand picked side men. Simple…we have sign up sheet at venue. Pick your song, we give you lyrics. When your song is called, come up and join the band! No, we can’t play every punk song from 1867 to present day. We hand pick our favorites from 1983 back to when dinosaurs pogoed along side with the punchers. 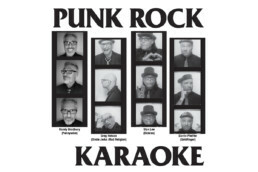 Punk Rock Karaoke was a band originally formed in 1996 in a Los Feliz bar and restaurant in Los Angeles called Vida to serve as entertainment for a New Year’s Eve party. Created as an all star side project by Greg Hetson (Redd Kross, Circle Jerks, Bad Religion). Later members to join the group include Steve Soto (Adolescents, Agent Orange, C.J. Ramone), Stan Lee The DickiesThe DickiesD.I. (band) and following the departure of Derek O’Brien Darrin Pfeiffer (Goldfinger) on drums.